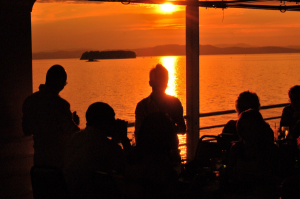 Enjoy panoramic views of Lake Champlain and the Vermont Mountains while enjoying delicious food and beverage. 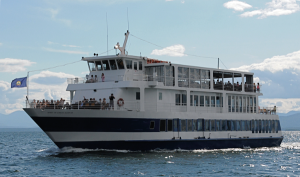 Our triple deck luxury cruise ship offers daily scenic, lunch, brunch and nightly themed dinner cruises available seven days a week. Our Scenic Narrated Cruise will fascinate travelers with our Captain’s tales of history, geology and wildlife. Bring your camera, just in case you see Champ, our elusive lake monster. 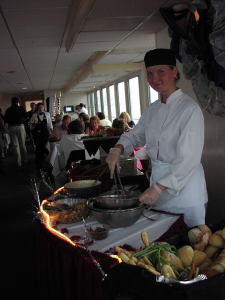 Our Executive Chef prepares fresh entrées, buffets and snack bar items from our on-board galley. 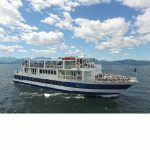 Enjoy our Lunch on the Lake Cruise featuring a delicious buffet while listening to the exciting narration or our sip champagne on our popular Champagne on Champlain Brunch. 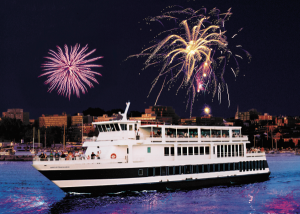 Themed dinner cruises include an exciting lineup of our Sounds of Summer, Murder Mystery, Lobstah on the Lake, and Captain’s Dinner Dance. 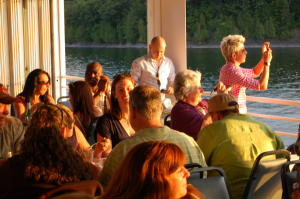 Join us for our spring and fall cruises with live entertainment, our Springtime Dinner and our Harvest Moon Dinner! Both with delicious buffets to match the beautiful Vermont seasons. Dining decks are enclosed, heated and air conditioned.